Opening of Programs 2015. 2015 is a new chapter in the life of St Michaelâ&#x20AC;&#x2122;s - one of the most ambitious we have ever programmed, as we continue to explore the link between spirituality and wellbeing. We have over 20 ticketed events, eight volunteer-led programs, weekly organ recitals, a new Spiritual Wellbeing Series of workshops, plans to increase our online education courses as well as several new programs in development. Pick up a copy of our programs booklet, join us online and subscribe to our email list to keep up to date with these events. 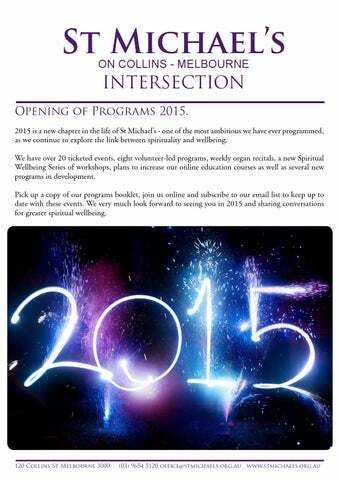 We very much look forward to seeing you in 2015 and sharing conversations for greater spiritual wellbeing. Celebrating the 2015 Opening of Programs. On Sunday 8 February we celebrated the opening of our 2015 programs. Margaret Smith’s inspiring decorations cascaded from the balcony along side a banner proclaiming the theme for 2015 Conversations for Enhanced Spiritual Wellbeing. Guest artists Shu-Cheen Yu (soprano), The Orchestra of St Michael’s led by Rebecca Adler and The St Michael’s Brass Ensemble led by Geoffrey Payne delighted everyone with a marvellous selection of music and the congregation sang loudly and joyously throughout the service. The programs were launched with a short film and uproars of applause. 300 of the weighty, 44 page, programs book swere distributed and the summer sun came out just in time for our BBQ feast at Elements Cafe. With sausages, veggies, salads and coffee in hand, the atmosphere was friendly as the congregation eagerly read about the many exciting seminar, workshops, concerts and performances coming up at St Michael’s in 2015. Dr Francis Macnab and Dr Debra Campbell-Tunks open the 2015 programs at St Michael’s. The beautiful flowers and decorations arranged for the day. Dr Francis Macnab welcoming everyone to Morning Service. The Orchestra of St Michael’s and Rhys Boak on organ. The St Michael’s 2015 Program books. The St Michael’s Brass Ensemble and Rhys Boak on organ. International Connections with St Michael’s. Her visit sparked the flame of interest in our congregation and the wider Melbourne community in the noticeable link between spiritual wellbeing and psychology. In response, the St Michael’s Church council was motivated to elevate the spiritual wellbeing programs of The Centre for Wellbeing @ St Michael’s in 2015. To this end, Dr Debra Campbell-Tunks, Dr Francis Macnab, Erin Cookson and the staff of St Michael’s have created a program of events and activities for 2015 that will focus on the aspects of Spiritual Wellbeing. Over the years St Michael’s has connected with thousands of people across the globe. We have a strong internet presence, connecting with over 3,000 people each week via our YouTube channel and Facebook page. The rich history of St Michael’s as a city church has also assisted in the development of many ‘congregations’ scattered around Australia and the world. There are many people who visit us on Sundays, attend our programs, watch our online videos, participate in the conversations we create via social media and join us for special events such as marriages, baptisms and music concerts. Many live overseas, interstate or in rural Australia and though they are physically far away they continue to see St Michael’s as one of their valued places. In addition to the 2015 program, Dr Francis Macnab and Dr Debra Campbell-Tunks have entered into a collaborative relationship with Professor Miller and her network of colleagues working in spiritually-oriented psychotherapy and spirituality research programs. By being part of this network with Professor Miller’s new initiative, LEO (Learning, Evolving, Opening), the Spirituality Mind Body Institute Wellness Center at Teachers College, Columbia University, we aim to be a contributing partner in international research into spirituality and wellbeing. As LEO is a relatively new initiative, and St Michael’s has a long history of spiritual wellbeing programs we are keen to collaborate in this global network of like-minded professionals. Meaning, purpose and connectedness are core desires and drives for most people, essential to health and happiness. If we are to define spirituality as encompassing these, then it is vital that encouraging spiritual wellbeing is something we give increasing attention to in mental health and wellbeing programs. For further information on our Spiritual Wellbeing Series browse our list of programs on our website www.stmichaels.org.au. Below are a few examples of what to expect in the coming months. In 2015 you will see a new symbol at St Michael’s, shown above, the symbol that marks our Spiritual Wellbeing Series. A series of workshops, seminars, online courses and research projects will explore the connection between spirituality and wellbeing. We live in a time and culture where many people have rejected religion, yet Australian researchers have reported that 47% of people surveyed in a large scale study called themselves “spiritual.” A large number of that 47% reported that they considered themselves ‘spiritual but not religious’. As this represents a large shift over the past two generations of Australians, it begs the question, what is spirituality? We know that ‘being spiritual’ means very different things to different people - but is there a core meaning that draws people to want to identify themselves as spiritual? Psychology on Sundays. in the U.K.), the extraordinary therapeutic community of Maxwell Jones (which became a significant influence on the early shape of Cairnmillar), and the early work of R. D. Laing. Dr Macnab’s early therapeutic work involved groups of patients diagnosed with chronic schizophrenia, and in this he was introduced to the work of the Washington School of Psychiatry, Dr Harry Stack Sullivan, and later to the field of existential analysis. In Melbourne, he established The Cairnmillar Institute. It has become a distinctive centre for psychotherapy and for the training of psychotherapists and counsellors. It was the “birthplace” of the psychotherapy method of Contextual Analysis and Contextual Therapy. Many people will never enter a psychotherapist’s consulting room. But the teachings of psychotherapy could benefit people on a wide scale if only those teachings could be readily accessible. In 2015 we are introducing a “pilot” study called Psychotherapy on Sundays led by Dr Francis Macnab AM. These sessions will take the form of topical talks. They will not be a substitute for psychotherapy in practice, but rather they will develop themes that will be helpful to people in their everyday lives. Psychotherapy on Sundays will be held on Sunday afternoons at St Michael’s. The sessions will commence at 12pm and finish at 12.55pm. Dr Macnab draws from a career of over 50 years as a psychotherapist. His psychotherapy training (with individuals and groups) began in a long-stay mental hospital in Scotland. Psychotherapy on Sundays will aim to bring to an interested audience, the accessible and relevant teachings of Psychotherapy. Some of the topics that will be explored are: Getting free of a hurtful experience, a distressing memory, a damaged life. The power of self – self-confidence, self-worth, self-importance. Protective factors of your emotional and mental health. How to ADAPT to how things “ARE”. Are there steps in making a successful adaptation? Resilience factors. The traumas of life and their treatment. Mingary, The Quiet Place At Home and Abroad. In 2015 St Michael’s will be forging a partnership with Dr Steven Koski of the First Presbyterian Church of Bend, Oregon, U.S.A in the development of Mingary Bend: A Centre for Wellbeing. The development and partnership with Mingary will help carry the healing and restorative spirit that has touched and transformed the lives of so many in Melbourne to the people of Bend in Oregon. Twelve years ago Mingary, The Quiet Place was constructed at St Michael’s as a place for reflection and renewal for people going through stressful times. Anyone can become a member of the Coracle. All you need to do is write a letter to people you know who might receive some benefit from visiting Mingary, The Quiet Place. In times gone by, people living on the many small islands of Scotland would carry food and comfort to their neighbours using a small boat, called a coracle. A coracle is a carrier of nurturing friendship. Mingary, The Quiet Place, provides a unique space to allow anxieties to settle and emotional strengths to be refocused. It places no demand on people. It is open to people of any religion, or none. As part of the development of Mingary, The Quiet Place, we are inviting people to become part of the Coracle of Mingary: Helping spread the word about this unique space which gives people a place to reflect, remember, and be restored. 2014 saw a growing numbers of people from the city and rural communities requiring our support in their times of illness and stress. Sample letters will be available to download from the St Michael’s website. Letters will also be available as part of the meditation booklet that is being produced. We are delighted to continue Dr Francis Macnab’s spiritual and psychological revolution with the expansion of Mingary, The Quiet Place, around the world. Visit www.stmichaels.org.au for more information about Mingary, The Quiet Place and the Coracle of Mingary. Ties Across Time The spirituality of remembering the ties across time. How we are enhanced and strengthened by influences of existential importance, reflections, conversations, thoughts and prayers. Most people have seen how quickly a relative or friend can deteriorate after their 59th birthday or after their 79th birthday. Could that deterioration have been prevented, or slowed down? Searching for Harmony Once the great psychologist of a past era wrote in “The Varieties of Religious Experience.” “The visible world is part of a more spiritual universe… a harmonious relation with that higher universe is our true end.” The Transcendent Studies on the relationship of spirituality and mental health claim that various mental health problems are reduced when there is a ‘meaningful’ connection to ‘the transcendent’. What does ‘The transcendent’ mean? How is ‘The transcendent’ accessed? What are the dynamics of reducing the occurrence and the severity of mental health problems? St Michael’s has long been an advocate of healthy ageing and in 2015 we continue our dedication to thriving in old age. The Golden Rope Thriving becomes part of the ‘triumph of experience’. GOLD is the symbol of triumph. We all want to ‘hold on’ to the GOLD ROPE of all that is good: our youth, our hope, our strength of spirit our courage, our wholeness. SAGE SAGE events offer psychological insights and information about healthy ageing in a friendly interactive forum. Each month we choose a topic and bring you a series of strategies and tools to help you cope with the big stresses in the years post 55. Visit www.stmichaels.org.au for more information and to book your seat at the next SAGE seminar. Special Events. The Oxford dictionary defines entertainment as the action of providing, or being provided with, amusement or enjoyment. 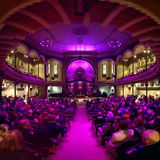 Music and special events have always been integral to the vitality and inspiration offered at St Michael’s. In 2015 this tradition continues with vigour. Anthony is a cast member of the ABC radio comedy show Thank God It’s Friday!. He is the creator and director of the United Nations of Comedy which aims to bring together the best comedy from around the world and build bridges between cultures through shared humour. The Sydney Morning Herald and The Australian newspapers acknowledged Ackroyd as one of the best comedians of his generation. Cosmopolitan Magazine dubbed him “The Man of the Moment”. Beat Magazine declared him “one of the ultimate comedy legends”. We are thrilled to welcome Anthony to St Michael’s to bask in the health and wisdom of laughter (and his highly entertaining persona). We are thrilled to welcome Melbourne International Comedy Festival favourite Nelly Thomas as she teams up with ABC Radio’s George McEncroe and Australia’s favourite Octogenarian Ethel Chop to honour mums this International Women’s Day. What better way to celebrate being a woman than to laugh about the ups and downs, the good, the bad and the ugly of womanhood and motherhood? With several husbands and nine children between them, ranging from two to sixty-two years of age - this show promises to be a no-holds barred expose on maternal matters. Wilma Smith and Friends Friday 13 November, 7pm Wilma Smith will be among the many internationally renowned artists appearing at St Michael’s in 2015. Wilma Smith is a Fijian-born violinist raised in Auckland, New Zealand. She has been concertmaster of the New Zealand Symphony Orchestra, and since 2003, co-concertmaster of the Melbourne Symphony Orchestra in Australia. Wilma studied at Auckland University and had an early professional experience with the Auckland Symphonia (now Philharmonia) and New Zealand Symphony Orchestra. She then continued her studies in Boston at the New England Conservatory with Dorothy DeLay and Louis Krasner. Bookings for these events can be made online at www.stmichaels.org.au or www.centreforwellbeing.org.au. Remembering 2014 Christmas at St Michael’s. Evgeny Chebykin during the Christmas service. Christmas 2014 was a joyous celebration of life and hope. The glittering decorations of Margaret Smith’s uniquely decorated Christmas tree served to remind us of the jewels of hope we can find in everyday life. Dr Macnab spoke about the birth and growth of the human spirit in our own age. He asked us to adopt two powerful, alternative “symbols” (alternatives to the symbols of violence and destructiveness that continue to absorb so much of our civilization’s attention and resources) during this Christmas period and beyond, so that we might foster an evolution of our human spirit. He names these two symbols altruism and compassion. The beautiful Christmas tree designed and decorated by Margaret Smith. Midsumma at St Michael’s. humanity, the celebration of a spiritual depth, and a transcendence that lifts us beyond our violence and our tyranny… to a better way of tenderness and goodness in all human hearts - oh, it’s a dream of course. But a dream worth having!” The beautiful arrangement of Australian native flowers were donated by Rosalie, Lois, Christine and Meryl in memory of their father Russell Baker. The Processional Staff and carried by Laura Beckett to promote diversity and acceptance within St Michael’s. Harry Brockwell performing Freight Train on the Didgeridoo. Harry Brockwell, a Melbourne Didgeridoo player and maker celebrated Australia Day by perform during our special Australia Day service. He performed two original works, filling the church with an inspiring meditative melody unique to the Didgeridoo. Having studied with well-known Didgeridoo players in Arnhem Land Harry told us that he loves to share the many exciting and rewarding attributes of the Didgeridoo whilst maintaining a respect for the traditional communities where the instrument plays an integral part of society. St Michael’s supports the Mental Health of Australian Doctors. We are delighted to welcome back to St Michael’s one of Australia’s leading International Relations scholars and commentators, Professor Joseph A. Camilleri OAM. Professor Camilleri will present a lecture series in which he will be interpreting the most critical social, economic, environmental and security challenges of our times. Exploring how these challenges affect us personally, our networks and communities, our nation and the world. Now Emeritus Professor at La Trobe University, Joseph Camilleri was the founding director of the La Trobe Centre for Dialogue. In a career spanning 45 years he has taught over 30,000 students, supervised some 40 PhDs, authored or edited over 25 books and written over 100 book chapters and journal articles. Professor Camilleri has researched, lectured and given evidence to government and other enquiries on issues of governance, human rights, security, the role of religion and culture in contemporary society, and the politics of the Asia-Pacific region. Visit www.stmichaels.org.au to book tickets to this series. Rev dr Malcolm Sinclair sends his regards. Reverend Dr Pamela McNally Anderson was the guest minister at St Michael’s on January 11. Originally from the USA, she is a graduate of the San Francisco Theological Seminary. She is currently on the staff of the Trinity Cathedral Sacramento, California. In a recent letter, Dr Malcolm Sinclair stated that the St Michael’s Intersection, December 2014 edition, was “visionary, honesty, hopefully, realistic - just what I have come to expect from St Michael’s.” Rev Dr Malcolm Sinclair, the minister of Metropolitan United Church in Toronto Canada, has been a guest minister at St Michael’s on several occasions. Dr McNally Anderson dedicated her address to the Dance of the Soul. Stating that there are occasions in life that fill us with so much intense joy that the emotion seems to flood the brain and spill over into the rest of the body; the natural response is to dance, as the fullest expression of that jubilation. Dr Sinclair spent his time in Melbourne, speaking on several topics as part of our Sunday Service and weekday programs. He has spoken at council meeting’s, reflecting on the particular concerns of inner city ministries across the world - our similarities, our differences. On Sunday 2 February we bade farewell to Sarah Tomilson, who has become a fixture here at St Michael’s where she has worked as a Verger for the past seven years. These visits have built a bond between St Michael’s and Metropolitan United Church: a connection that has been continually strengthened over time with ongoing support and communication. Dr Macnab held a special moment during Morning Service to acknowledge and honor Sarah’s dedication to her work at St Michael’s. We look forward to continuing our conversations with Dr Sinclair in 2015. The team at St Michael’s will miss Sarah very much. We have enjoyed working with her and wish her continued success for the future. Music has an important role to play in the functioning of society and has had for many thousands of years. No human culture appears to be without music. Singing, in particular, seems to be universal. The music program at St Michael’s brings us some of the best musicians and music that Australia has to offer to enrich our experience during our Sunday services and special events during the year. Some of the special musical events we have planned for 2015 include: ANZAC Day Service, 19 April - This year marks the 100th anniversary of the ANZAC landings at Gallipoli. Join us for a special service with music by the Melbourne High School Choir commemorate ANZAC Day. Wilma Smith & Friends, 13 November - An evening of inspirational chamber music. All proceeds will go towards the wellbeing and mental health programs of St Michael’s. Thursday Organ Recitals - Every Thursday at 1pm St Michael’s the grand organ comes to life for a free 30 minute recital. For all the details of our 2015 music program visit our website www.stmichaels.org.au. Sundays at St Michael’s. Sundays at St Michael’s is unique for the relevant, contemporary preaching that embraces inner wellbeing as our core message; we also offer a wide variety of Sunday programs after Morning Service. St Michael’s is a place which affirms and encourages the best expression of who you are and who you can be, through the Sunday service and numerous wellbeing programs and our commitment to counselling and psychotherapy. The Centre for Wellbeing @ St Michael’s offers secular programs suitable for people of any faith or no faith, with a focus on spiritual wellbeing. St Michael’s also offers a range of volunteer-led, free, programs that are open to anyone who whishes to attend. Sunday has long been a special day for churches, the traditional day to hold services and ceremonies. More information about Sunday events and activities can be found at our website www.stmichaels.org.au. It is with sadness that we announce the passing of three longtime members of the St Michael’s congregation; Donald George McCurrach and Gail Bourke. We offer our condolences and support to their families and friends at this time. What people are saying about St Michael’s. Have you visited the gardens lately? Take some time to experience our gardens next time you visit St Michael’s. Take a journey into the Mingary Garden, along the stepping-stone path. Once enclosed within the quiet space, sit and reflect in front of the stone fountain. A space like the Mingary Gardens a person can retreat from the noise of the world and reflect. The Big Tent Project Update. The Big Tent Project is expanding to rural Victoria. The training program headed by Dr Francis Macnab which has supported Kindergarten Field Officers for over 20 years, will now be available in country Victoria. We are excited to announce that with the support of Marie, Kylie and Jenny - members of Melbourne KFOG. St Michael’s, The Big Tent Project is now able to offer training and supervision to Kindergarten Field Officers in Mildura, Ballarat, Bendigo and South Gippsland. This training program operates under the rationale: If we help build one child’s self-worth, we set that child on a new and better pathway into their future. By helping one traumatised child in a kindergarten, we help their 30 or so classmates; we help the staff; we help the parents. The project explores how we can prevent children from being troubled and potentially disturbed and violent adults. We hear more and more about domestic violence and how it can damage children. The Big Tent Project is building a new way of caring for thousands of traumatised children in kindergartens across Melbourne, the state of Victoria. If you would like to help support this important program by making a donation please fill out the form below or visit www.cairnmillar.org.au. If you are seeking relief from painful or stressful experiences, assistance with major life changes or help reducing anxiety, fear and uncertainty, call Mingary Counselling services to make an appointment today. Or visit The Quiet Place (pictured above): a peaceful, nondenominational sanctuary for people of all religions and cultures. Open 8am to 5pm weekdays and 8am to 1pm Sundays; enter from the Russell Street side of St Michaelâ&#x20AC;&#x2122;s.